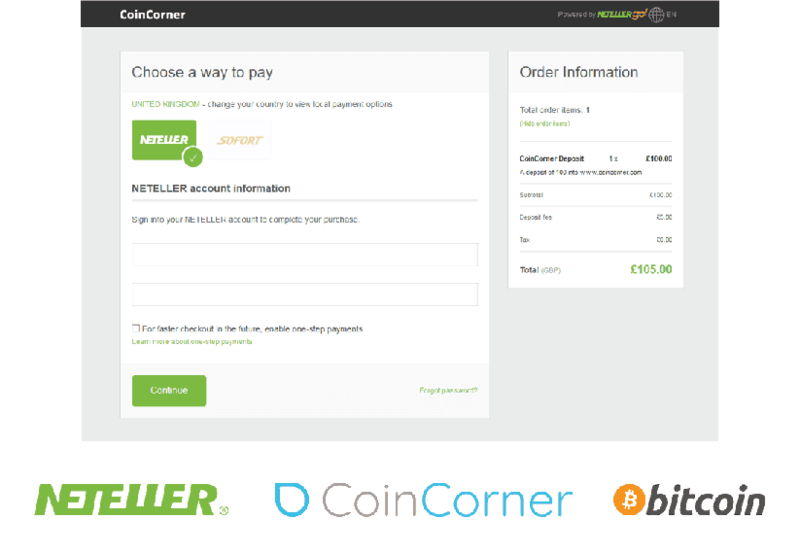 CoinCorner offers a number of easy ways to buy Bitcoin, including Neteller. Using Neteller provides a fast, simple and secure option to instantly buy Bitcoin, either in GBP or EUR. Since introducing NetellerGo, we’ve been able to make Bitcoin even more accessible to our customers. Neteller is a global online wallet (much like PayPal) which allows you to deposit funds to your CoinCorner account without disclosing any debit or credit card details. A trusted and simple alternative to using traditional payment methods, you can access your Neteller funds online and make Bitcoin purchases easily at any time of the day. Buying Bitcoin with Neteller is instant. If you want to buy Bitcoin using Neteller but don’t have a CoinCorner account yet, don’t worry, you can sign up for an account here. It’s free to have an account with us and takes minutes to complete our sign up form. Once you’ve made an account and been verified, please visit the deposit funds page to select how much you would like to deposit via Neteller.